The European Union’s ambitious goal of achieving an 80 percent reduction in greenhouse gas (GHG) emissions below 1990 levels by 2050 has been met with much scepticism to date. However, a detailed study released in April 2010 argues that this can be done without compromising the level of service in energy that European citizens enjoy at present. Roadmap 2050: A Practical Guide to a Prosperous Low-carbon Europe was completed by the European Climate Foundation (ECF) in partnership with experts from energy industry companies, consultancy firms and NGOs. “The results were surprising,” says ECF’s Policy Director and Program Director for Transport Dr. Martin Rocholl. Rocholl, who presented the report at the recent Great Transformation – Greening the Economy conference in Berlin told the audience that “there is a positive story to be told about climate change and we believe this report illustrates that”. The mission of Roadmap 2050 is to “provide a practical, independent and objective analysis of pathways to achieve a low-carbon economy in Europe, in line with the energy security, environmental and economic goals of the European Union”. But unlike conventional studies that use forecasting to predict where current trends will end up in the future, Roadmap 2050 applies a ‘backcasting’ methodology where the end state (e.g., emission reductions of 80 percent) is pre-determined and the paths to get there are based on existing possibilities (e.g., renewable energy technologies). The report considered different scenarios or pathways where different proportions of renewable energy (40 percent, 60 percent and 80 percent) were complemented by nuclear power or carbon capture and storage (CCS). The 80 percent pathway can be achieved through deployment of existing technologies already commercialised or those in the late stage of development. The 80 percent pathway in Figure 1, which assumes 10 percent each for nuclear and CCS facilities, can be achieved through deployment of existing technologies already commercialised or those in the late stage of development. The report also finds that decarbonization would enhance, not derail, growth and security, particularly in the long term as Europe lessens its dependence on foreign oil and gas imports. In additon, relative to the existing baseline, the overall cost of energy in the decarbonized pathways is estimated to decline by 20-30 percent in the long term. In relation to employment, 400,000 jobs will be created in green tech industries, in contrast to the 250,000 jobs lost in the fossil fuel industry. This transition will require a massive investment of €7 trillion (US$8.6 trillion) over the next 40 years. If an integrated electricity grid is built in Europe, it can take advantage of the continent’s topographic and meteorological diversity that extends from Norway’s significant hydropower capabilities in the North, all the way down to sunny Spain’s solar capacity in the south. 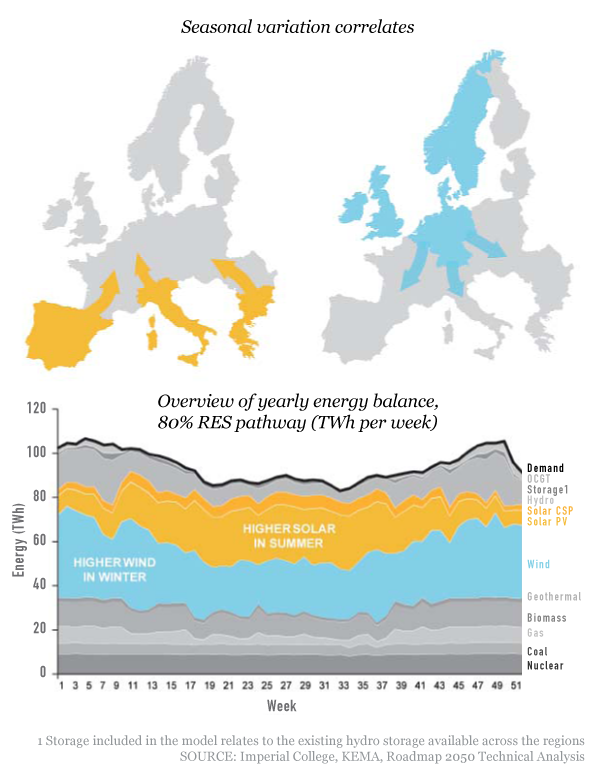 With respect to these seasonal and geographic balances, the study’s modelling in aggregating different renewable technologies, such as solar thermal and photo-voltaic, wind, geothermal and biomass, as well as non-renewable sources, has produced a very positive result. As Figure 2 illustrates, in the winter months, greater wind energy availability balances out the reduced load from solar sources. To date, critics of renewable energy have argued that fluctuations in energy supply from renewable sources compromise energy security at certain times of the year. Other common criticisms include the relative high price of renewables in relation to fossil fuels and general unreliabilty of renewable power sources. Rocholl believes that the calculations from Roadmap 2050 de-bunk myths about all fluctuation, cost and reliability concerns. “No matter which pathway scenario you use, the classical arguments against renewables are now off the table,” he says. Given his pedigree as a former Director of Friends of the Earth Europe, it is no surprise that Rocholl speaks so avidly about renewables. He was therefore keen to stress the strong involvement of multiple stakeholders from the industry throughout the process. Organisations involved in the project include consultancy firms like McKinseys and Oxford Economics, energy firms like Shell and international NGOs like the World Wildlife Fund. (It should be noted that as sole author of the study, ECF is alone responsible for its content). “The value in the study is that it was done in close cooperation with the relevant industry, which until recently was rather sceptical about large shares of renewables,” Rocholl argues. Like any study, especially one looking 40 years into the future, the report makes several assumptions that we cannot yet be 100 percent sure about, including that electric vehicles proliferate in the future. 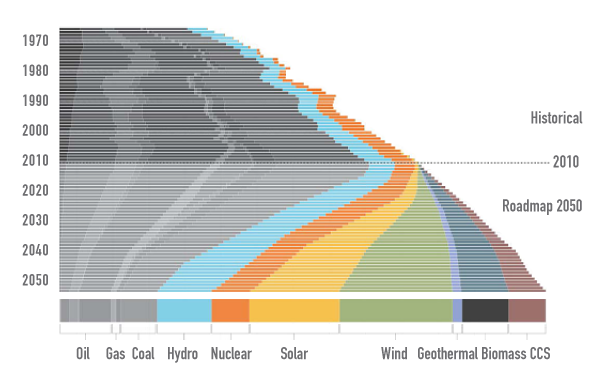 Notable among these assumptions is that the remaining energy needs will be met by nuclear energy and CCS. 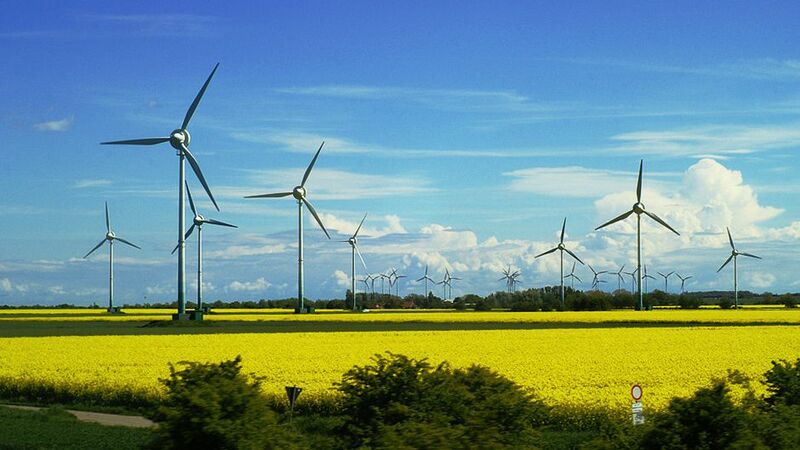 “The study allows society to freely choose between renewables, nuclear and CCS. The energy system will work in any case and society can now base its decision on other issues, such as the risks connected to different technologies,” says Rocholl. Establishing nuclear power stations takes decades and CCS is, according to many experts, either a distant prospect or simply not an option. However, establishing nuclear power stations takes decades and CCS is, according to many experts, either a distant prospect or simply not an option. Conversely, some of Roadmap 2050’s assumptions may actually underestimate the feasibility of achieving emissions reductions into the future. The report assumes energy efficiency gains of 2 percent per annum. Although 2 percent is by no means assured, fellow conference delegate and internationally renowned scientist Ernst Ulrich von Weizsäcker believes that, if the will is there, key industries can achieve resource productivity improvements by a factor of five. From an ethical standpoint, it is refreshing to see that the study has not factored in the use of international carbon offsets that would allow the Europeans to purchase clean development mechanism credits. In other words, the report does not count fossil fuel emissions outsourced to developing countries. After giving Rocholl’s presentation, several audience members expressed concern that the figures and assumptions in the report were overly favourable to renewable technology. So, does Rocholl believe that the study has been optimistic in any way? “I think where we are optimistic is where this will be put into practice by politicians. We just don’t know if we’ll see the political will to take the necessary political steps in the next years to put Roadmap 2050 into practice. Beyond that, the necessary expansion of the grid is a huge challenge to the green community,” he said. Supporters believe they now have the economic as well as the moral justification for Europe to pursue a clean energy pathway into the future. In addition, they believe that this challenge can strengthen the unity of the EU at a time when it is being severely tested by the international financial crisis. “This is the most important project for Europe’s united future – it is innovative and imaginative, it needs European cooperation and it can and should be done,” Rocholl told us. Roadmap 2050 is available to all audiences through a creative commons license here. Europe’s Roadmap To A Renewable Energy Future by Mark Notaras is licensed under a Creative Commons Attribution-NonCommercial-ShareAlike 3.0 Unported License. This is certainly hopeful. The fact that the industries were themselves involved, and the assumptions being made aren’t overly unrealistic, mitigates immediate concerns. Of course, harnessing the political will and public support to focus on this amidst the gathering storm of Europe’s economic mess and other distractions remains the biggest challenge, I think. While I remain dubious about the viability of basing such a plan on the existing ‘endless economic growth’ paradigm, I acknowledge that we have to work from where we are, a world in which that economic mindset is firmly in place. I really hope this roadmap gains necessary traction. Market reform, that’s a keyword!